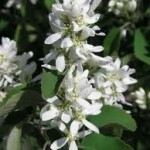 Amelanchier alnifolia ‘Obelisk’ is a superb, compact new variety of this popular tree. It has a narrow, fastigiate habit which makes it ideal for small gardens, and bears a profusion of white flowers, from top to bottom, in spring. The purple berries produced in late summer and early autumn are attractive to birds, and the foliage colours wonderfully in autumn. This variety is also mildew-resistant.